Bookmark us! No rumors, speculations or bullsh*t analysis. Only facts. 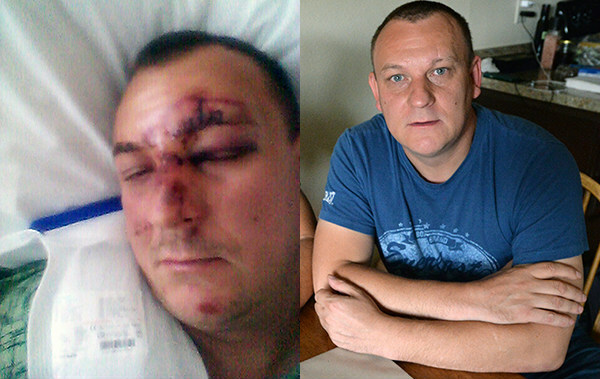 In late 2014, Gregor Lesnik was an unemployed Slovenian electrician living with his mother and expecting a child with his girlfriend. A nearby construction company, ISM Vuzem, was looking for workers, and he signed up. "There were no jobs in Slovenia, I needed to provide for my family" he said through a translator. His visa application described him specialized skills and said he was a supervisor headed to a South Carolina auto plant. Turns out, that wasn’t true. The unemployed electrician had no qualifications to oversee American workers and spoke only a sentence or two of English. He never set foot in South Carolina. Instead, he was sent to a menial job at Tesla Motors - along with 140 workers mostly from Croatia and Slovenia - where he earned the equivalent of $5 an hour lifting heavy pipes, and installing them into the ceiling and through the roof of the paint shop. With his co-workers, he was flown into the U.S. for months at a time, housed in nondescript apartments, and shuttled to the Tesla Fremont plant six and sometimes seven days a week for a 10 hours workday, according to workers. While foreign workers can obtain B1 visas for supervisory duties, the workers at the Tesla plant were simply installing pipes and welding parts — hands-on work banned by the terms of their visas. While most of the imported workers interviewed for this story said they are happy with their paychecks, their American counterparts earn as much as $52 an hour for similar work. Lesnik’s three-month tenure ended a year ago in a serious injury where he fell nearly three stories to the factory floor and broke both legs, some ribs and tore ligaments in his knee while drifting in and out of consciousness in his bed at the Regional Medical Center of San Jose. He filed a lawsuit against Tesla Motors, Eisenmann and ISM Vuzem, exposing a troubling practice in the auto industry. Overseas contractors are shipping workers from impoverished countries to American factories, where they work long hours for low wages, in apparent violation of visa and labor laws. "We have concluded that there is widespread abuse of the B1 visa in the Bay Area" said Michael Eastwood, assistant district director of the San Jose area office of the U.S. Department of Labor. He was unfamiliar with the allegations against Tesla contractors. Yet neither the contractors involved nor Tesla itself have accepted legal responsibility for the hiring practices, long hours and low pay. 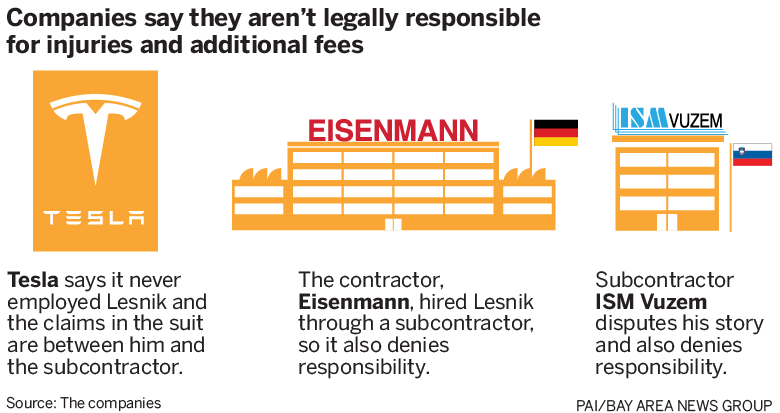 Tesla and Eisenmann won a preliminary effort to be removed from the lawsuit, but an Alameda County Superior Court judge has allowed Lesnik’s amended complaint against them to move forward. claiming it wants to make things right with Mr. Lesnik as this "is not a legal issue, it is a moral issue." "At Tesla, we aspire to operate on the principles of hard work and exceptional performance, but always tempered by fairness, justice and kindness. There are times when mistakes are made, but those are the standards to which we hold ourselves. With respect to the person at the center of this weekend’s article in the Mercury News, those standards were not met. We are taking action to address this individual's situation and to put in place additional oversight to ensure that our workplace rules are followed even by sub-subcontractors to prevent such a thing from happening again. Gregor Lesnik was brought to the Tesla factory by a company called ISM Vuzem, a sub-contractor brought in by Eisenmann, the firm that we hired to construct our new, high-volume paint shop. We contracted with Eisenmann for the simple reason that we do not know how to build paint shops and they are regarded as one of the best, if not the best, in the world. In our dealings with them, we have found them to be an excellent company, run by good people. 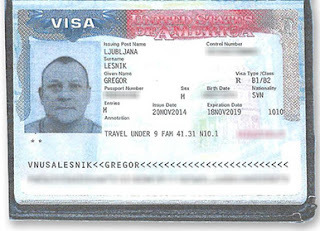 The article describes how Mr. Lesnik came to this country, the conditions under which Vuzem employed him and others to do their work, and how Mr. Lesnik ended up being injured while on the job. Assuming the article is correct, we need to do right by Mr. Lesnik and his colleagues from Vuzem. This is not a legal issue, it is a moral issue. As far as the law goes, Tesla did everything correctly. We hired a contractor to do a turnkey project at our factory and, as we always do in these situations, contractually obligated our contractor to comply with all laws in bringing in the resources they felt were needed to do the job. Regarding the accident that resulted in Mr. Lesnik being injured, Cal/OSHA (the government regulator that investigates workplace accidents like these) came to our factory, investigated the incident and found that Tesla was not responsible. When Mr. Lesnik brought a workers compensation case, Tesla was dismissed from the case because the judge concluded that we had no legal responsibility for what occurred. All of that is fine legally, but there is a larger point. Morally, we need to give Mr. Lesnik the benefit of the doubt and we need to take care of him. We will make sure this happens. We do not condone people coming to work at a Tesla facility, whether they work for us, one of our contractors or even a sub-subcontractor, under the circumstances described in the article. If Mr. Lesnik or his colleagues were really being paid $5 an hour, that is totally unacceptable. Tesla is one of the highest paying hourly employers in the US automotive industry. We do this out of choice, because we think it is right. Nobody is making us do so. Tesla will be working with Eisenmann and Vuzem to investigate this thoroughly. If the claims are true, Tesla will take action to ensure that the right thing happens and all are treated fairly. Creating a new car company is extremely difficult and fraught with risk, but we will never be a company that by our action does, or by our inaction allows, the wrong thing to happen just to save money."